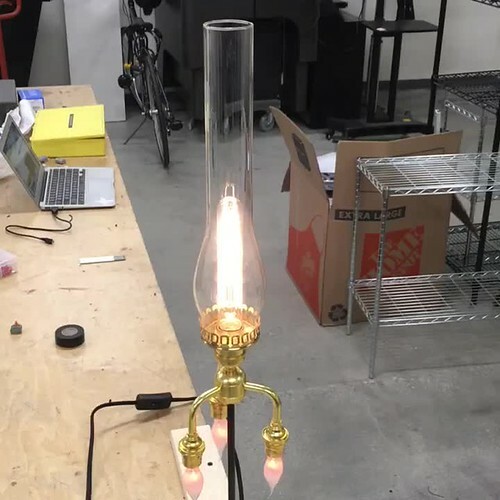 While surfing Grand Brass (the goto place for traditional lighting parts) I stumbled across a few parts that made me think I could build a lamp that looks like an old timey rocket; so I did! I was looking at their frosted glass flame shades thinking I could make something Lumière like when I saw their brass clusters looking very engine like. Combining that with the classic flame-effect neon bulbs and we were off to the space races. I was designing by the seat of my pants so I tried to minimize the complexity of the build. I chose a chimney holder that would thread onto an UNO threaded bulb holder so I wouldn’t need some other support structure. I chose the tallest chimney they had to try and hit a 1/3rd rocket engines to 2/3rd bulbous rocket body proportions. The main bulb is incandescent since it’s a better match to the neon than an LED bulb would be. The final decision was the desk clamp. I wasn’t sure how big of a slab of cloud like alabaster I would need to support it as a table lamp or if it would be easy to knock over no matter what so the clamp was an economical and safe solution. I also grabbed a cloth cord with the switch already installed to make wiring easy. The parts cost a total of $107 dollars. Thanks to my previous experience assembling my chandelier I was pretty confident in my ability to pick parts and assemble them. If you’re interested in building lamps, I highly recommend Paige Russell’s Instructables Lamps Class which I naturally didn’t find till I was writing this post. I’m considering frosting the chimney seaglass green to make it a more Futurama-like rocket. Maybe even turning it into a sconce above my cross-stitch. I’ve included the parts I ordered below. Only things missing you might need are what I had on hand: wire nuts, wire, and electrical tape. You can find a couple other photos on Flickr. I’ll definitely be building more light fixtures and I might make some more of these. Will I make you one? Maybe.